Broadband Satellite TV Signal Splitter 15 - 2150 MHz with All Ports Power passing, is a high-frequency Splitter Designed with diode steered circuitry, which allows the DC power to pass from any output port to the input port and prevents DC backfeeding. Features Horizontal F Ports, Grounding Block Attached, and Solder Back Case for 130 dB RF shielding. Note: When Splitting the High Frequencies of Satellite TV Services to feed multiple Receivers, the Loss associat3ed with the Splitter May need to be compensated for with the use of an Inline Satellite Drop Amplifier specific to this purpose and Frequency Range. Consider the need and review the "Satellite TV Amplifier" category for selection. Also the issue of supplying Voltage back to the LNB(F) may be addressed more resolutely with the installation of a Power Supply and Power Inserter specific to the purpose. Consider the need and review the "DC Power Inserter" category for selection. Commensurate with Coaxial Cable TV Antenna and Satellite TV Power Inserter Installation, you want to Ground your Cable TV or HDTV Antenna Coaxial Cable System Outside before bringing the TV Cable Inside. This way, Lightning Strikes and Power Surges have an opportunity to arrest before reaching your Satellite Receiver and TV Set(s). The Integral Grounding Block designed onto most Outdoor Use Compatible Satellite Signal Splitter We sell will effectively convey this unwanted Electrical Energy to a Ground Rod via a Copper Ground Wire that you Install (not included). Consult your Local Building Code and NEC for guidance to Properly Grounding your HD TV Antenna, Satellite TV, Cable TV, WI-FI, Wireless Internet, Business Band, CB or Amateur Radio Antenna Installation. Satellite Splitters Typically Pass from 950 to 2050 or 2150 MHz. and are used between the LNB (LNBF) and the Input of the Satellite Receivers. In this manner a Satellite Signal Feed from the Dish can be "Split" to feed multiple Receiver Units. Low Voltage is Present in this link between the LNB and Receiver and should be maintained and respected. With a 2 Receiver Setup, Voltage to the LNB typically would only be required from one or either of the Receivers. Some Splitters (HOLLAND) have diodes that eliminate the back-feeding of voltage back and forth between the Receivers, otherwise you may have to disable the Voltage eminating out through the "Input" port of one of the Receivers (this function is usually switchable for this purpose). With Multiple Receiver feeds in a "Head-End" scenario where receivers are dedicated to specific channels for mixing and carriage onto a Cable TV or Satellite Master Antenna System, the question of feeding Voltage back to the LNB is addressed with a separate power inserter for this purpose. 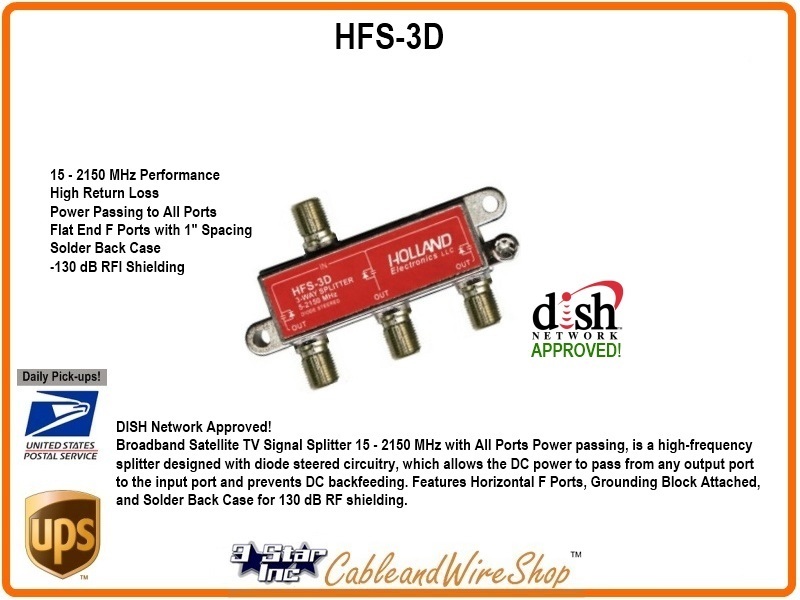 If you have Off-Air Antenna TV Signals mixed with the Satellite Signals, you will need "Wideband" Splitters that have a minmum start frequency of 50 MHz and again, pass up to 2050 or 2150 MHz. (depending on Service). Those Splitters that have a Start Frequency of below 40 MHz are used for carriage of both Satellite and Cable TV with Return Band two way services like Hi-Speed Internet Broadband Modems and Set Top Pay-per ViewTV Converters. These 3-Way Satellite Splitters are typically the Part you would use to take One (1) LNB(F) Feed and "Split" it into Three (3) in order to present Signal to 3 Independant Receivers. Please be Sure to Select the Appropriate Device not just By Manufacturer and Price. But Rather, Consider the Specifics of Bandwidth, Packaging (Indoor vs. Outdoor), Insertion Loss, Powering Requirements Up/Down-Stream and the Overall Needs of the Final System You Wish to Create. When Splitting the High Frequencies of Satellite TV Services to feed multiple Receivers, the Loss associated with the splitter may need to be compensated for with the use of an In-Line Satellite Drop Amplifier specific to this purpose and Frequency Range. Consider the need and review the "Satellite TV Amplifier" section for selection.